Nikon Coolpix S2900 is an entry level model from Coolpix Style range of stylish and slim compact cameras from Nikon. It can be seen as the successor of Nikon’s last year S2800. Both the cameras are quite identical in specifications as well as price. The Nikon Coolpix S2900 has a 20.1 megapixel CCD sensor, 5x optical zoom and video image stabilizer. The camera is wrapped up in a super-slim case which is available in five different colour options – silver, red, black, purple and purple line art. The Nikon Coolpix S2900 comes under the price range of 500AED, which is very much nominal for the individual. Nikon Coolpix S2900 has a 20.1 MP CCD sensor at the heart, which is capable of a maximum sensitivity of ISO3200. There is also Wind Noise reduction while recording videos. The Coolpix S2900 is 20 mm in thickness. It is a very thin camera indeed. With a mere weight of 119 gm, it is also very light. Therefore you can keep it into the pocket, like a slim smartphone. Due to this more sleekness – there is a little grip on to. The silky matte paint finish is extremely slippery. There’s only a textured rear thumb grip. Buttons are of good size, and can be pressed easily. The plastic casing is of a good build. The Coolpix S2900 are two menus options. The green button of camera has a access to mode menu, in which one can select simple shooting modes such as Smart Portrait, Manual Scene Menu, Auto, Auto Scene Selector, and Digital Filter Effects. The second menu provides with a variety of artistic and wistful filter effects. The main menu can be found by pressing the Menu button. It split into three sections for the camera, video, and settings. The start-up time is quite quick, and the camera switches on, focuses and takes picture in a fraction over 1.6 seconds. 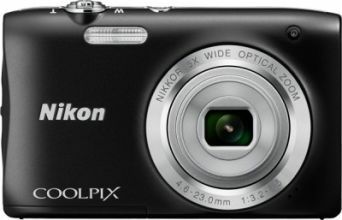 It can be said as average, but for a Nikon Coolpix S2900 camera of this price range, it is quite impressive. The camera’s Expeed C2 processor can be frustratingly slow, which makes some controls sluggish to take effect, and also prevents anti- zoom adjustments until the previous image has been completely recorded. Low ISO images are excellent. There’s no noise, sharp edges and high definition in darker areas. There isn’t much change in the quality of the images till ISO 400. Auto Scene Selector, Manual Scene Menu, and Digital Filter Effects. Colour noise gets worst at ISO 800. Overall the camera performance can be said as quite good, although as the ISO is increased, the camera resolution drops and so does the image quality. It has Li-ion power pack rechargeable battery. Rated capacity is 250 shots per charge, although you can take above 270 photos with minimal flash usage. Coolpix S2900 provides Glamour Retouch and Smart Portrait option at low price range.